Even the clearest air has many tiny particles suspended in it called "aerosols". 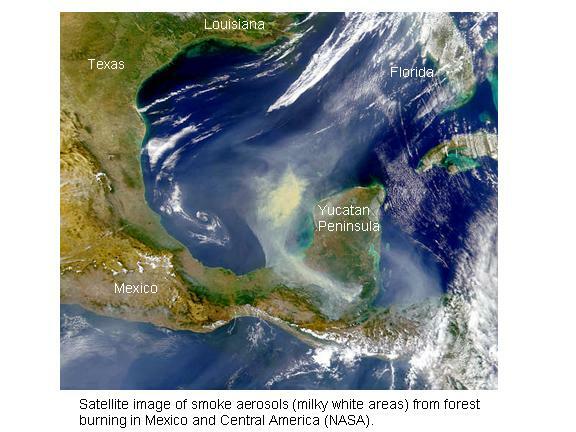 It is not unusual for there to be 10,000 aerosols per cubic centimeter (160,000 per cubic inch) of air. These come from many sources, both natural and man-made: the soil, salt from the ocean, plants, the burning of fossil fuels or vegetation. Aerosols can be solid, liquid, or a mixture of both. Even though this sounds like "pollution", aerosols are very important for the formation of clouds. Virtually all cloud droplets initially form around an aerosol. The more aerosols there are, the easier it is for clouds to form. After they are produced, aerosols typically only last a few days before they are washed out of the atmosphere by rain systems. REALLY CLEAN AIR: Some of the cleanest (most aerosol-free) air is found in the tropical upper troposphere over the ocean. Most of the air in these regions originates from the tops of thunderstorms, in which the rain has washed out virtually all impurities, leaving the air extremely clean. VOLCANIC AEROSOLS: When a major explosive eruption occurs from a volcano, millions of tons of sulfur dioxide can be injected into the stratosphere. Once there, chemical reactions occur which form sulfuric acid. These sulfuric acid aerosols remain in the stratosphere for about 1-3 years, and can cause temporary global cooling by reflecting some of the incoming sunlight back out to space. The most recent occurrence of this after the major eruption of Mt. Pinatubo in the Phillipines in June of 1991.